I've been shopping around for the perfect postage stamp for my wedding invitation and I need some help! The standard options available from the post office aren't thrilling me. I know I can purchase custom stamps but I don't know how to start. Can you help? Custom postage can be, as the name suggests, custom to you! Did you want to use a custom monogram? A photo of your favorite puppy? An engagement photo? Here is a perfect way to use it! Currently there are two companies in the USA that can create "real" postage - Zazzle.com and Photostamps.com. The main difference between the two companies is the fact that with Photostamps.com you can adjust the color of the denomination of the stamp to almost any color you want. With Zazzle the only option is black. The other GREAT thing about custom postage is the fact that is does not have to be hand cancelled. Now, this is an ongoing challenge/problem that I have with rectangular envelopes but custom postage has a tiny QR code on the stamp that acts as a hand cancel. 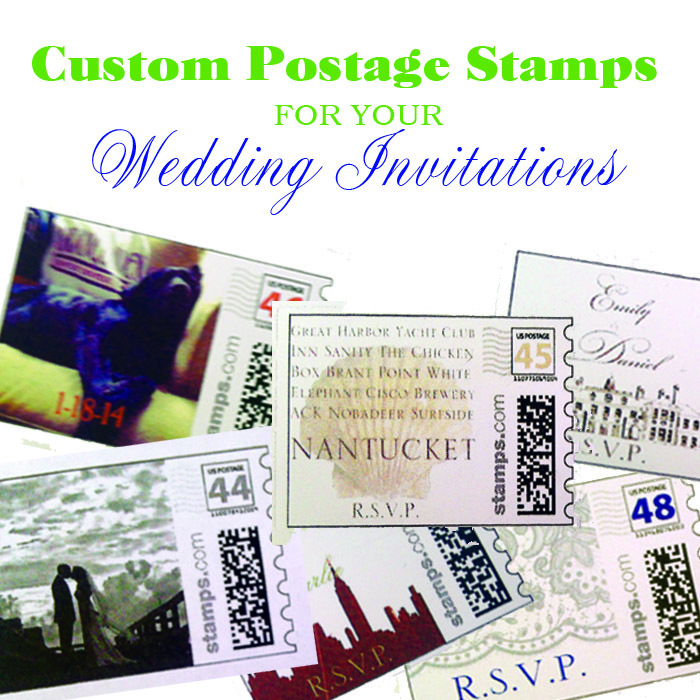 This custom designed stamp has the stamp denomination in a coordinating color. This custom stamp was designed to go with this couple's thank you cards. The pricing on the custom stamp is a little more than regular postage (about $5-$10 more per sheet), but for your once in a lifetime wedding invitation, isn't it worth a little extra splurge for the custom postage? We think so! To us, we think it's one of The MOST Perfect of Details for your wedding!